Pros: The unpredictable format of the show keeps you on your toes. Cons: With everything from incontinence to Donald Trump up for discussion, the show touches on lots of subjects but provides new insights on none. An engaging but somewhat confused evening of boundary-pushing performance. “Excuse me, could you answer the phone for me please? Here’s your script, you’re the secretary.” With these words Lois Weaver gets one of my fellow audience members out of her seat, and elicits a round of nervous chuckling from everyone else. If you’re not keen on audience participation and in your late fifties or older, you’re out of luck at tonight’s performance. 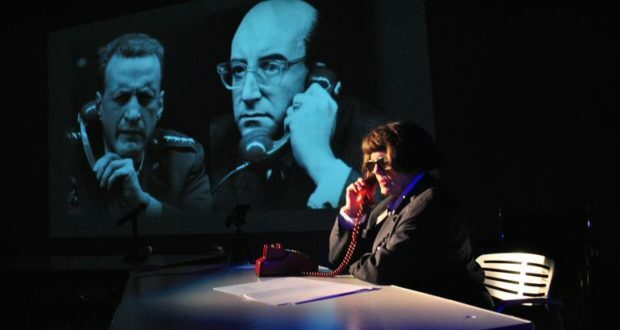 Split Britches was founded in 1980, and for the past 38 years Weaver and her collaborator Peggy Shaw have been pushing at the boundaries of theatre making. In Unexploded Ordnances, this entails sorting their spectators by age (“Who was alive during the Second World War?” “Who remembers the Korea War?”) and cajoling the ten oldest ones into joining their council of elders. This is done with varying levels of reluctance. Inspired by Stanley Kubrick’s classic Dr Strangelove, Weaver and Shaw lead us in a contemplation of our biggest worries – aging, pollution, the Israeli-Palestine conflict – all in the one hour we have left before nuclear Armageddon. Weaver’s Madam President frequently rolls around on the circle of tables set up on stage; Shaw’s swaggering General barks down the phone and jumps every time Weaver mentions ‘the general feeling’. Behind the characters, their interactions have that ease about them that you only get from knowing each other very, very well; it’s a real pleasure to see a pair of performers that are so finely attuned to one another. Weaver’s way with her elders is fantastic as well: sympathetic, but without room for much dithering about on stage. It ensures the smooth running of what has the potential to be a very awkward show, with audience members on stage outnumbering the actual performers five to one. There are a lot of good things going on here then, but there are also just a LOT of things going on. The set up, which flicks between performed scenes, discussion with the council of elders, music and projections on the three big screens, lacks clarity. We’re never allowed to linger on one topic for too long; instead, issues are pulled out, examined briefly and then thrown onto the ever-growing pile of Very Big Problems. Unsurprisingly, this doesn’t lead to any new insights, and so the process quickly becomes rather depressing. At the same time, this millennial did find it encouraging to see that apparently the gap between baby-boomers and my own generation is not as stark as is often made out in the media, because we do clearly all worry about the same things. In the end, Weaver and Shaw do send us off with a glimmer of optimism for the journey home, but nevertheless I can’t help but feel that the duo have perhaps bitten off a bit more than they can chew.